Our product range includes a wide range of dish wash liquid cleaner for kitchen, rinsing liquid for dishwasher machine and liquid detergent for dishwasher machine. 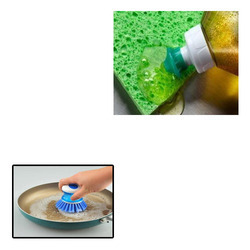 We are instrumental in offering Dish Liquid Cleaner for Kitchen to our valuable clients. This product is a non foaming liquid and is bio-degradable. Our quality product provides effective cleaning and is able to sanitize properly. These liquid is made hygienically and gives shiny cleaning to the utensils. It cleans in one swipe and is easy to use. It is skin friendly as well that attracts our clients to demand this liquid cleaner. We specialize in manufacturing Liquid Wash, which is an effective product for Neutralizing excess alkalinity of the detergents during the rinse cycle. This highly concentrated product is also a liquid drying aid, which finds application in residential and commercial complexes. We hold an expertise in manufacturing Dishwasher liquid detergent, which is also supplied by our organization to the leading clients across the various sectors of the industry. Further, this product is a non foaming liquid and is bio-degradable. Our quality product provides effective cleaning and is able to sanitize the work area properly. Looking for Dish Liquid Cleaner for Kitchen ?